Light is the number one underestimated factor of growing, even at the seedling stage. If seedlings don’t have enough light, they grow more slowly and can become leggy. Overall, growers who do not give seedlings enough light have longer crop timelines and higher rates of seedling mortality. Why do growers mistake the level of seedling light? They don’t have enough lighting. They place lighting too far from seedlings (bad coverage). They don’t leave lights on long enough. Usually, these problems are easy to fix: add lights or adjust your seedling light schedules! Here are some general seedling light guidelines to speed up production and save you money on seeds. How far away should I place seedling lights? You’ve got to keep two goals in mind: the amount of light you’re giving seedlings, and the coverage of light that you’re giving seedlings. We can measure the useful light to a plant (PAR—photosynthetically active radiation, or the parts of light that the plant can use to photosynthesize) in micromoles per meter squared per second (micromoles/sec/m²). 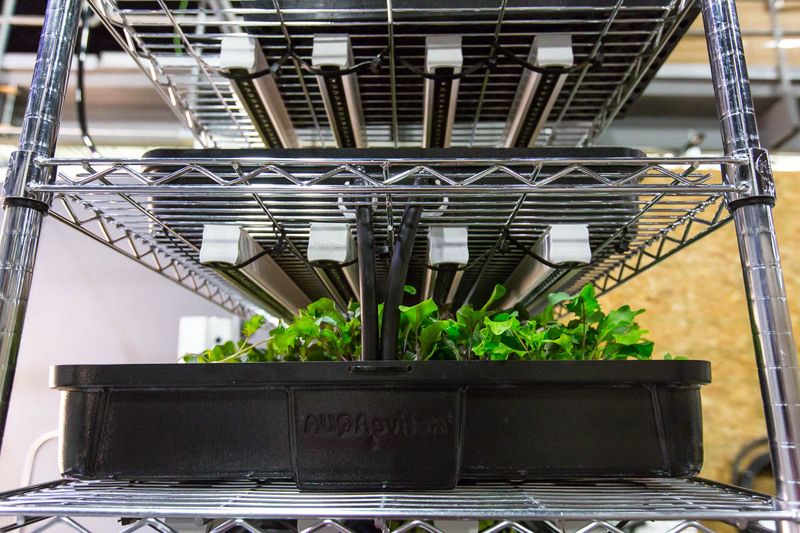 The goal here is to deliver 120–150 micromoles/sec/m² of PAR to your seedlings. Some people will use a PAR meter to figure out how much PAR they’re getting to their seedlings and will adjust the distance of their lights based on that measurement. Don’t worry—you don’t need one of those if you’re using LED bars or fluorescent bars. Just remember the following distances. The next question is coverage. You can usually just eyeball this to figure out how far apart your lights need to be to deliver the same intensity of light across your entire seedling tray. Stick to these rules, and your seedlings will be ready to transplant in no time. How long should I keep lights on my seedlings? One convenient thing about artificial lights is that you can set them to turn on and off by themselves using timers. But how long should you keep light on your seedlings? Growers are going to need 12–18 hours of light per day. Your place in that range depends on the costs of two things: real estate and electricity. Which one is inherently higher for your facility? This gives you four situations. 1) If the cost of real estate is higher, then you want to move things through your space quickly. This means that you will be paying for more hours of light (18 or so) to move crops along. 2) If the cost of electricity is higher but you have plenty of space, then you’ll want to reduce lighting a bit (12 or so hours). This means that your crops will grow slower. 3) If both costs are equally high like they are at our farm here in Laramie, then you’ll find a balance. We give our crops about 14 hours each day. 4) If both costs are equally low, then go ahead and run them fast, at about 18 hours a day. (Just remember to give crops everything else that they need as well, like airflow and CO2, or they won’t be able to use all that light. Don’t forget to harden your seedlings before transplant! Remember to harden off your seedlings before transplanting them! Hardening seedlings involves hardening them to things like temperature and humidity, to reduce plant shock. It also means hardening them to light. To harden your seedlings, place them in the main growing area for a few hours a day in increasing periods over about a week. Need light help with the rest of your farm? Light is one of the most important factors for growing healthy crops. Being a modern farmer like you comes with both a blessing and a curse: on one hand, light technology has never had so many quality options. On the other hand, choosing a lighting type can be a very overwhelming task. To help you cut through the noise, we wrote The Modern Farmer’s Guide to Artificial Lighting. This guide explains the factors of a good light, how LEDs work, and some special considerations that indoor farmers may have for lighting. All the above will generate and making ground for hydroponics/Aquqaponics cultivation but, at a snail’s pace growing popularity of organic vegetable in urban areas. I am now trying to develop manpower and appropriate technology for our condition in cooperation (providing me lab and space) with Khulna University and also involving community for cultivation as do it yourself (DIY) approach. If I develop and standardized in Bangladesh condition then it must be a good productive agriculture system in water and land scar areas of Bangladesh, additional introduction of Aquaponics in urban city is a must to considering energy-water-environment- poverty- nexus of our country. The growth of urban population in Bangladesh is alarming compeer to any country of the world. Aquaponics is the highest productive food system would be cultivate in of season that’ are the beauty of the system (Farmers may get high price of vegetable) Aquaponis may go beyond season (which is my thrust area beside construction cost), for which it able to meet additional income of poor and future food security without impedes nature as water requirement (water footprint) is 95% less and productivity is 3 to 5 time higher and across seasonality that goes beyond existing agriculture and aquaculture practice, for which it would be good in coastal areas, where fresh water is scares. I am also trying to introduce Cow’s urine (Organic compost mater) in village grassroots small agriculture farmer with low-cost greenhouse. By 2050, we need to figure out how to not only feed but also nourish the three billion new people who will be joining the seven billion of us who are already here on the planet, and the year 2050, nearly 80% of the earth’s population will reside in urban centers. Applying the most conservative estimates to current demographic trends in Bangladesh is more adverse. And we need to figure out how to do this as effectively, ethically and as environmentally sensibly as possible. How are the red/blue diode color combinations better than white light? Hi Jack, plant pigments absorb lights at very specific wavelengths. Chlorophyll a and Chlorophyll b, the two main photosynthesis pigments, absorb red and blue lights. Hey Nicola, sorry about that. Could you specify which link? I’ll get the correct one in there asap! Great info here! Would you mind elaborating on the importance of hardening (first time I hear about it…), how much shock is there generally, and how does that affect operation / any tips? One other thing I’m having trouble figuring out is how do you crunch the numbers on cost of real estate vs electricity then derive the number of hours of light? Hey Edmund, sure. If the environment where you start a seedling and the environment where it is moved to mature are very different, then the plant might not have the necessary structure and defenses to deal with differences is temperature, airflow, light, etc. For instance, if a seedling is grown in a system that is sheltered and the air if very still, then it will not have the cues to grow a thick stem. If it is moved into a system with a lot of airflow (or outside where there is wind), its thin stem won’t be able to handle the change. Hardening a seedling is just breaking the transition from one environment to another into small steps so that the plant has the time to get ready for its new environment. Hey Atif – great question. At the seedling stage, plants typically only need 100-150 um/m2/sec. Fluorescents would provide plenty of light in this case. Just make sure that you have enough airflow to help with the heat! I’m new at this. Starting veggies and flowers in my basement. I gave grow mats and 2 led light boxes. From reading I see the seeds need light for 12 to 18 hours a day. How about the heat mats. How long do they need to be on? Water daily? The one system I bought has self watering system. Heat mats generally only need to be on until seeds have germinated. Daily watering is a good place to start. The media needs to stay damp during germination, but not waterlogged or soggy. Is there danger of too much light? As in, if you have say 200 or 300 thousand micro moles? Just asking because because you seem to have a couple of 4′ tubes and I have a fixture that has 4 LED tubes. Am I in danger of providing too much light? The light itself will not hurt them, however, there is the possibility that the lights can cause the plants to get too warm or to dry out. The seeds don’t necessarily need darkness or light, depending on your varieties. By stacking the trays you limited the airflow over the seeds, which can cause the moldiness. Try keeping them open. Read this blog for more information on germination. in the germination stage .does the seeds need watering every day? You should water them a little bit in small increments throughout the day. Keep them moist, but avoid over-watering—there should be no standing water in the trays. To help mitigate the problem, I raised the lights to eight inches, but within 24 hours, it was obvious that distance was still not enough. Through additional observation and research, I then raised the lights to 25” above the plants. However, light-bleaching was still an issue. I’ve continued to monitor plants and make adjustments. At the time of this posting (day six under lights), I’ve disconnected one of the two lights, which is currently 20″ above the plants. I’m sure I’ll be going higher still as plants continue to get taller. If you don’t have the budget for or interest in setting up a more advanced grow light system, remember that you can find success in the simplicity of a basic, 40-watt shop light. Rest assured that you won’t lose much regarding growth by using shop lights or any other full spectrum light. The light-bleaching could also be the result of a deficiency. Double check your EC and pH levels to be sure they’re within the recommended ranges. I’ve just set up my grow light frame and have my first tomato seedling emerge. My 45w Roleadro is currently at 20″ as this site has diagrams that suggest the PAR levels are around 150 at this hight. You mentioned having 8-12″ gap between the lights and plants. Is my light more powerful than the Phillips you mention or could the 20″ the diagram suggests be wrong? Lights are quite complicated and will vary quite a bit not only based on brand, but also by spectrum and intensity. These will also depend on what type of lights you’re using (e.g. LEDs vs HID vs fluorescent). It is entirely possible that the lights you are using are much different than the lights mentioned here—make sure you are seeing the results you desire, and if not, make adjustments as needed! My plants were doing well but now some of them have leaves curling upwards and purple undersides? I’m not sure if my lights are causing this but I’m pretty sure I’m not over/under watering. I don’t want to move them higher up from the plants and them then grow leggy (if it’s not too much light causing it). Do you know what the symptoms of too much light are? My understanding is I would be seeing white patches if they were getting burnt. Upward curl could be due to overwatering or high humidity. The purple color is often associated with phosphorus deficiency. My grow frame is 25 inches wide by 53 long. I am having trouble choosing between a 6 bulb T5 HO fixture and an 8 bulb T5 HO fixture. Could you give me pros and cons on both? Hi Alan—there aren’t really any pros or cons in regards to lighting differences, so it’ll just be a matter of sizing. You’ll also want to consider costs as well as configurations. The article says 8″-12″ height for LED bars. What are the spec’s for these LED “bars”? What is the basis/logic for keeping LED “bars” higher than T5 fluorescents? I have LED shoplights that are 3000 lumens/4000K, what distance should these be from the top of germinated seedlings? If you have a shoplight so low (2″-8″) to the plants it doesn’t cover the whole width of a typical seedling tray. No one ever talks about the spread… how far does the light go to the sides from a typical bulb (LED & Fluorescent)?